Mary Kelley is a coach, personal trainer, triathlete, wife and mother of four. After 12 years in the corporate world, with coaching as a part-time passion, Mary retired from IT Consulting in 2009 to focus on coaching and personal training, and AIM4TRI was born. Her passion is to equip and empower individuals to reach their peak athletic potential through consistent training, while maintaining a healthy work-life balance. With more than 16 years of experience in the sport of triathlon, and over 26 years of competitive swimming and coaching experience, Mary knows how the right kind of consistent training gets results. 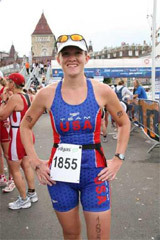 Mary completed her first triathlon in 2000 (Lake Saint Louis), her first half ironman in 2003 (HalfMax), and proudly served as a member of Team USA in the Hawaii (2005) and Switzerland (2006) World Championships. She has 9 First Place Overall finishes to her name, dozens of Age Group wins, and the title "USAT All-American Triathlete." To back up this practical experience, Mary holds certifications in Triathlon Coaching (USAT Level 1 Certified Coach), Personal Training (MLH&F Certified Personal Trainer, X-Force Certified Personal Trainer and ACSM Certified Personal Trainer), Run Coaching (USATF Level 1 Certified Run Coach), Spinning (Cycling Fusion Certified Spinning Instructor), Swim Instruction (YMCA Certified Swim Instructor) and Prenatal Fitness (NASM Optimum Performance Training for the Prenatal Client). She brings a unique perspective to her coaching, having lived, coached and raced all over the United States, Western Australia and the United Arab Emirates. She has helped hundreds of people achieve personal success through her coaching and guidance. Contact Mary now to start a coaching relationship! Join AIM4TRI now or Contact AIM4TRI to talk about starting a coaching relationship.